From charming Charleston to the historic seaport of Savannah, the South offers everything you could desire in a vacation—vibrant cities, the legendary locations important in music’s history, the scenic Great Smokey Mountains, warm beaches, and lots of Southern charm. On an escorted Cosmos tour, enjoy reserved seats at the Grand Ole Opry, taste Cajun cuisine in New Orleans, and step back in history at Colonial Williamsburg. Or relax on St. Pete Beach and enjoy the spectacular sunsets on Key West. Cosmos Southern USA tours give you these wonderful opportunities and much more at a price you can afford. If you are a music fan—don’t miss this Southern Sounds tour! Begin with two overnights in New Orleans, where your expert Local Guide knows the sights and sounds of the Old World City. 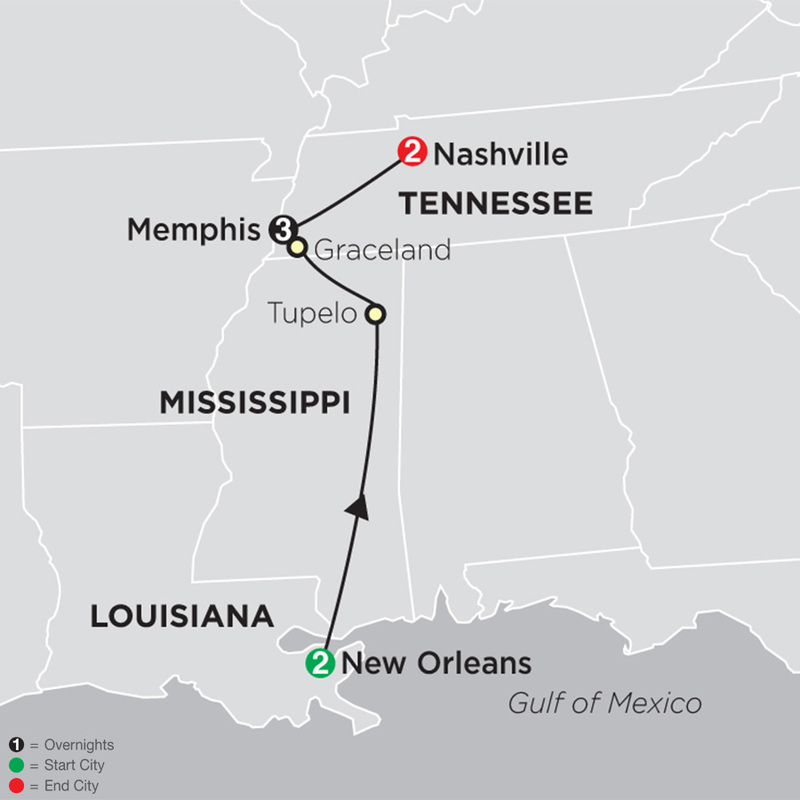 From New Orleans, travel to Tupelo, Mississippi, to visit Elvis’ Birthplace & Museum. This ...Read More. The beautiful South comes alive on this wonderful vacation featuring locations that have played a role in the evolution of American music. This southern U.S. tour starts with two nights in Chicago, ends with two nights in New Orleans, includes two nights in Nashville and ...Read More. 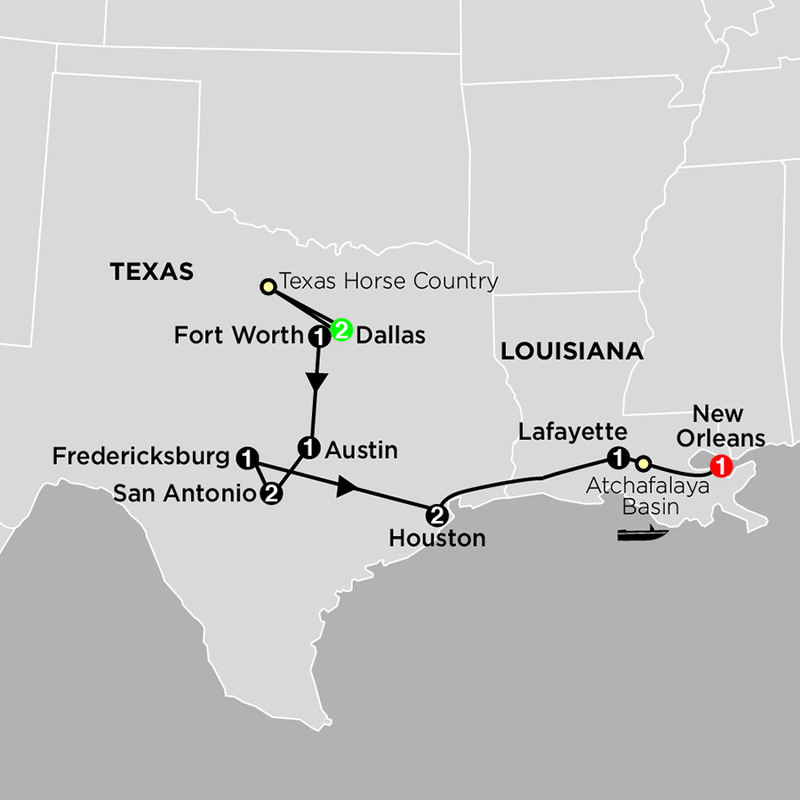 With its large size and diversity, Texas locals say, “Texas, it’s like a whole other country.” On this tour through the Lone Star State, you’ll discover its major cities—Dallas, Austin, San Antonio, and Houston—and some of its historic landmarks, museums, and must-see sights ...Read More. 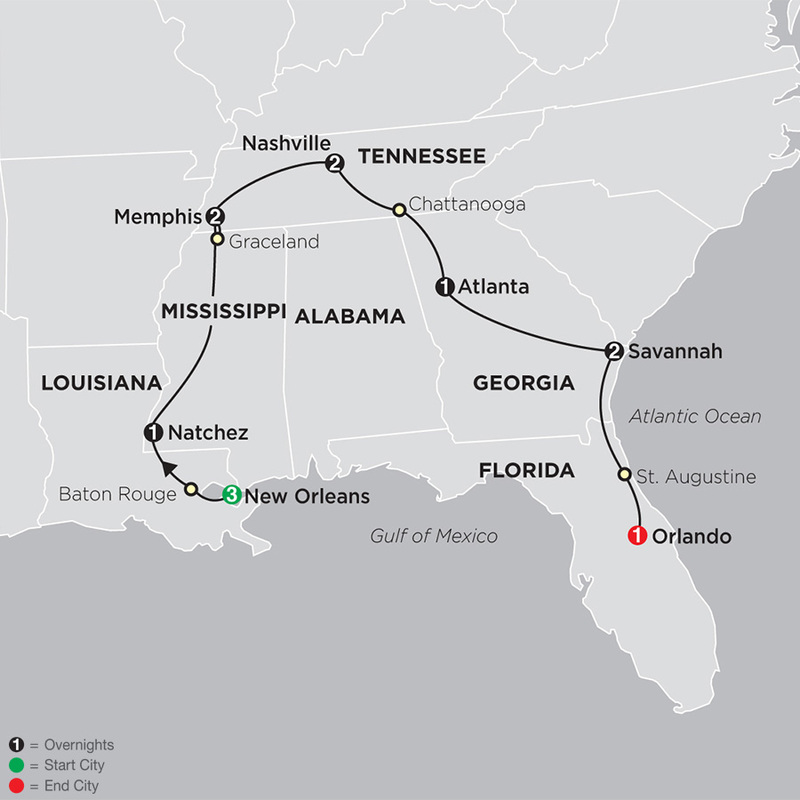 Enjoy the sights and sounds of the South on this wondrous vacation through the heart of Louisiana, Mississippi, Tennessee, Georgia, and Florida. This southern U.S. tour starts with three nights in New Orleans and ends with one night in Orlando. In between, you’ll stay two nights ...Read More. From colonial settlements and Civil War sites to the magnificent Blue Ridge Mountains and stunning Great Smoky Mountains, this southern U.S. tour features historic sites, spectacular scenery, and fun experiences all along the way. You’ll overnight in the Washington DC area; ...Read More. 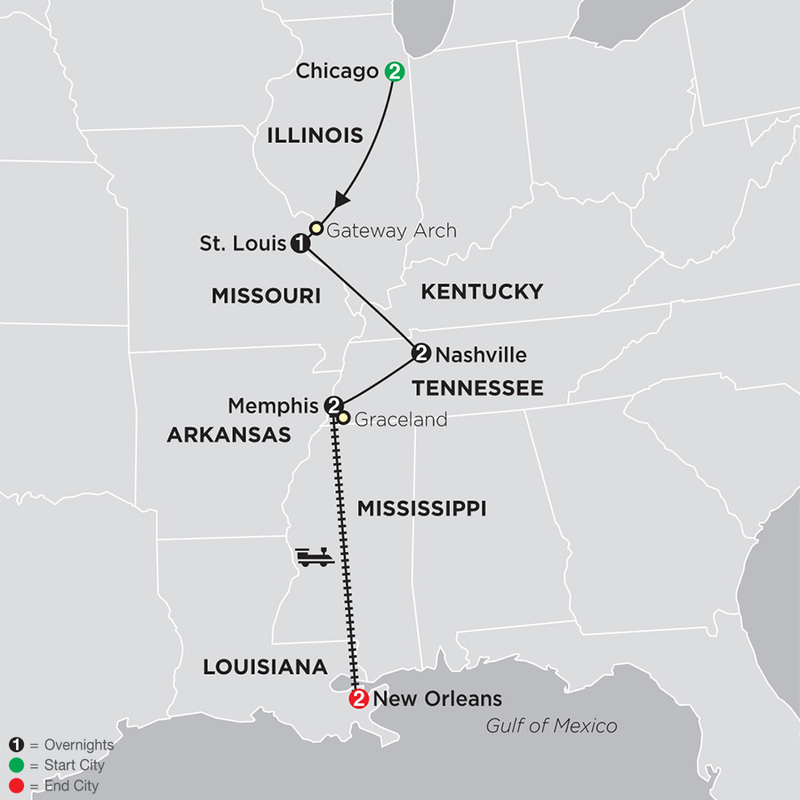 Get your kicks on Route 66 with a legendary trip across America. From Chicago to Los Angeles, your budget-minded tour of eight states includes stays in Las Vegas and the Grand Canyon. Your affordable vacation is just in time to attend the 18th Annual Mother Road Festival in ...Read More.